This part-time, research-based degree will further your professional development and enhance your career prospects. This research-based course is designed for those working in the field of education at all levels. It is suitable for anyone working in the education sector, including teachers, lecturers and administrators working in schools, post-compulsory or university sectors. Although it is not a teaching degree and does not provide QTS, it is ideal for those who have completed an accredited teacher-training programme or degree and wish to study the field of education further. Flexible teaching and learning methods allow you to study in the evening and at home. Learn from experienced tutors who are leading researchers and practitioners in the education field. Develop understanding of your field through independent research. Strong student support to help you achieve your goals. View our course information leaflet here. We are currently reviewing the content of our courses to ensure that they remain relevant and current to out students’ future ambitions and society. Please continue to check this course webpage for the latest developments. This is a demanding and exciting research-based programme. It requires you to immerse yourself in reading, thinking, discussion, reflection and writing, enabling you to take the next, critical step in your professional learning. This Masters degree allows you to investigate a range of issues impacting on education in general and your own organisation in particular. We want you to challenge your thinking. The three core modules are compulsory for all full time and part time students with no Accredited Prior Learning (APL) credits, and total 120 credits. This module will introduce the principles of theoretical and ethical issues that underpin approaches to the teaching and learning in institutions in various cultural settings. This module will offer you an opportunity to explore how curriculum design can promote innovation in teaching delivery and student learning and to consider critical ways to evaluate innovative teaching strategies and their effects on student learning. You will be able to analyse criteria for developing innovation and student interaction and discuss education policy and initiatives and scope for innovation. This module will help you to consider approaches to developing innovative classroom projects in your organisation. develop a critical appreciation of the ethical and professional issues which attend investigation in professional contexts. For progression to Dissertation students must take this module. This module is the final part of the Masters programme and available to those who have achieved success sufficient to be eligible for a Postgraduate Diploma and have successfully completed Research Skills. The Masters’ dissertation is a substantial piece of academic writing around a negotiated and agreed research focus. You must satisfy criteria relating to skills, knowledge and understanding of an educational or training issue and engagement in pursuit of academic excellence. You will have an opportunity to develop comprehensive knowledge and critical understanding of relevant theory, research, policy and/or practice through substantial and sustained, guided independent enquiry. This will develop the confidence and competence in writing to academic standards and conventions appropriate for publication. All full time and part time students with no APL credits from other postgraduate courses at either NTU or other universities must complete two optional modules selected from these six modules. This module aims to give an overview of some important and significant theorists in contemporary social/education theory, while encouraging students to think analytically about theoretical questions. This module offers the opportunity for participants to consider the role, purpose and contribution of educational theory on and for educational practice. Drawing on a range of theorists, for example but not exclusively, Etienne Wenger, Paulo Freire, Michel Foucault, Pierre Bourdieu, Lev Vygotsky, Jacques Derrida, Judith Butler, and Sandra Harding, the module invites participants to critically consider their contributions to the practices of contemporary education across a range of learning environments. Participants will be encouraged to critically compare theorists, defending or rejecting their usefulness for education. This module enables students to demonstrate they can locate and contextualise their understandings of educational theorists through critical analysis, comparison and evaluation, to educational practice. Additionally, students will be able to critically evaluate their own development as an educational professional. This module has been designed for participants who want to incorporate different theoretical concepts into their work and provides an introduction to the process of selecting and applying theories in their work. Gain a greater knowledge and understanding of the nature of educational policy and its impact on practice in your own and other educational institutions. Know how policy is contributed to at institutional, local, regional, national and global levels. Understand how educational policy relates to international, national and local concerns. For all involved in any enterprise it is essential to understand the change process. In education, where there is significant externally-imposed change and consequent (or self-determined) institutional change those aspiring to lead in such need to be able to lead and manage the process of change effectively. Through this module, you will by examination of theories of change and examination of case studies explore the complex nature of change and how to lead it effectively. to give you an opportunity to examine critically (in a secure environment) the leadership of change in your own institution. to provide an international context and comparison of change in education and how globalisation of policy and practice is shaping education institutions. The importance of a clear and well-considered approach to planning for and effecting change as well as the ability to respond appropriately to externally-imposed changes are central to this module. Throughout the module theories relating to change - both from within education and from the world of business and commerce - will be utilised and explored as to their usefulness in application in educational institutions. This module provides an opportunity to explore a wide range of perspectives on Special Educational Needs (SEN) and inclusion. These will include the perspectives of children and young people, parents, professionals, social value groups, academics and government. The module enables you to examine national and international perspectives, presented through research, literature, SEN/Inclusion groups and individuals’ experiences. It will also consider some of the key issues in the language of SEN and inclusion, reflecting on the nature of their impact on learning and teaching practices in educational settings. This module is offered through independent learning for students who are working in an education setting, who have recently attended a course of professional development (PD). It provides the opportunity to critically analyse, reflect and evaluate the impact of this on professional practice. This module requires you to reflect critically on the impact of a specific course of PD on your own practice. You will use this PD course as a basis for developing new professional practice in your workplace and evaluating the impact of this. You will also be required to consider how your learning from the PD could be disseminated to others and develop a strategy for this. The module analyses and evaluates sociological perspectives on justice, in/equality, aspects of social identity, inclusion and exclusion in education. It introduces a range of contentious issues and challenges for justice in education, and different sociological perspectives through which they can be analysed. There will be opportunity to bring your own views and experience to bear in these debates, while introducing you to new concepts, theories and methods. To enable you to reflexively draw upon, apply and assess concepts and approaches relating to social justice in your understanding of education, and inform your action to address social justice issues. The programme content reflects the changing education environment and is subject to regular review and development. You are expected to be in employed in an educational setting or have arranged access to a suitable educational environment. You will undertake research and reflection within this educational environment to support module sessions and assignments. Part-time attendance, at our Clifton campus, is usually one evening a week. You will also be expected to study independently between these sessions. A full-time study mode is also available. See the MA Education, Full-time course page for more details. Modules are assessed, there are no formal examinations. Students will also work on a number of different small scale research projects based in their work setting, literature review and a research based dissertation. The MA Education degree is increasingly seen as both academic enhancement and a means to facilitate career progress. Many graduates have gone on to successful careers within the education sector, pursuing senior roles, while others have continued studying to complete a Professional Doctorate, an MPhil or a PhD. The MA Education programme is not a teacher training course and will not give you Qualified Teacher Status. 96% of our Education Masters postgraduates are employed or engaged in further study six months after leaving (Latest DLHE Survey Postgraduate results 2015/16). a good degree, at a minimum of 2.2 from a recognised university. Work experience is preferred, but applications will be considered without it. We can find placements during the course for students without experience. A Disclosure and Barring Service check. 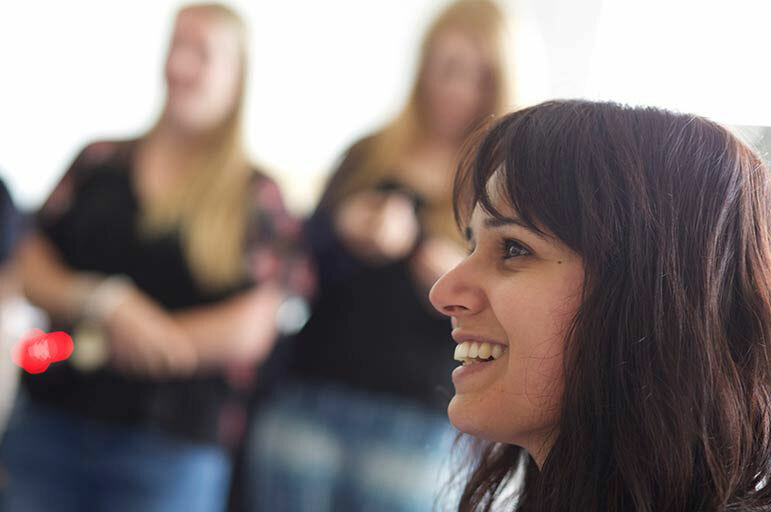 Applicants can use 60 credits from a PGCE or 120 credits from a PGDE towards the MA Education. £1,150 per 30 credit module, £2300 per 60 credit module. £2,210 per 30 credit module, £4,420 per 60 credit module.